Home > Car Care Products > Rubber & Vinyl > Wolfgang Cockpit Trim Sealant 8 oz. Seal and protect all interior surfaces with one product! Now you can keep the interior of your car looking and feeling new with a single product thatï¿½s incredibly quick and simple to apply. Wolfgang Cockpit Trim Sealant is an invisible, advanced synthetic polymer coating that provides a durable coating of protection and beauty to all leather, plastic, vinyl, rubber, wood and metal interior trim! Wolfgang Cockpit Trim Sealant replaces the need for multiple products! 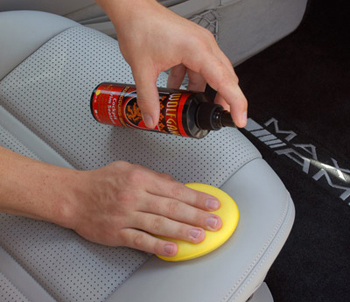 Protect all interior surfaces including leather, plastic, vinyl, rubber, wood and metal trim! Without proactive maintenance, interior trim fades, stains, cracks and dries out over time reducing your carï¿½s beauty and value. The sun, extreme temperatures, humidity levels, and normal wear-and-tear are continually attacking your carï¿½s interior trim surfaces and components. Wolfgang Cockpit Trim Sealant stops deterioration in its tracks with one simple and easy to use product that will cover the surface with a clear synthetic polymer coating. Protect your interior from ultraviolet sun rays, extreme fluctuations in temperatures, food spills, lipstick, body oils, grease, grime and more! Besides protecting all the plastic, rubber and vinyl trim inside your car from deteriorating, Wolfgang Cockpit Trim Sealant also preserves and beautifies the appearance to maintain the vehicleï¿½s value and aesthetics. Apply it to leather surfaces and they will remain soft and supple. Wolfgang Cockpit Trim Sealant is ultra concentrated so a little bit goes a long way. Wolfgang Cockpit Trim Sealant is non-greasy, non-oily and it dries fast after application. The synthetic polymers revitalize dull, faded surfaces bringing them back to life keeping them looking factory-new. Keeping your interior clean and looking new is easier than ever with Wolfgang Cockpit Trim Sealant. Treated surfaces will only require a damp microfiber cloth for maintenance and light touch ups. Wolfgang Cockpit Trim Sealant restores the richness of color to older vehicles and amps up the appearance of new car interiors without leaving an artificial shine or slickness. Interior surfaces need to be clean and dry before applying Wolfgang Cockpit Trim Sealant. Work on a cool surface in the shade. Shake bottle well before and periodically during use. Apply a small amount to a clean foam applicator and then work into the surface. When working on smooth, hard surfaces use a separate clean, dry microfiber towel to wipe-off any excess product. If less shine is desired on plastic, rubber, vinyl and leather surfaces, lightly buff with a clean, dry microfiber towel two minutes after application. Wolfgang Cockpit Trim Sealant 16 oz. My company car has just been replaced and I received a new one. The plastics inside it are very tough and I wanted to protect them against external factors and also to give them a pleasant aspect. I've just used WCTS to cover all the interior surfaces, plastics and leather, and I must say that the product is top shelf. I applied the sealant with a foam applicator and it left a satin finish on all surfaces and a kasmere feel to those tough surfaces. ProsA little goes a long way! The best interior shine/protectant I have used. It applies evenly. Its not too shiny, greasy or oily. Highly recommend it. I was a little skeptical at first. However, I pulled the trigger and ordered one bottle. I cleaned all the interior surfaces of my car and then applied the sealant with a foam applicator pad. The results were outstanding. The color of all the surfaces including the leather seats look great. Can't commend on durability yet but great product so far. I use the Wolfgang Cockpit Trim Sealant on all my Interior Vinyl and Leather Surfaces. This is a VERY durable and mostly maintenance free Interior protectant. There is no need for any detailer to keep sufaces cleaned off. Only a damp Microfiber will do to keep surfaces clean. This product has not lasted for days, or weeks as a lot of interior protectants do. I've had my Cockpit Trim Sealant on for over 3 months now, and it is still kickin strong. It does not leave a FAKE shine at all, like cheaper products do. It leaves a Beautiful Satin look to it, and after time develops an almost velvet feel on my surfaces. But that's just they way I think it feels for me. It's WOLFGANG! You can't go wrong. Also if you like WETS, you will Love WCTS! ProsEase of Application, Beautiful Satin look and feel, A little goes a long way. Only needs a Damp Microfiber to keep surfaces clean.